Description d’un Pavé en Mosaïque découvert dans l’ancienne Ville d’Italica, aujourd’hui le village de Santiponce, près de Séville; suivie de recherches sur la Peinture en Mosaïque chez les Anciens, et les Monuments en ce genre qui n’ont point encore été publiés. folio (680 × 510 mm), (54) ff. letterpress signed π1 χ1 1–521 and paginated (4) 1–103 (1), with nine engravings printed with the text (title, pp.1, 8, 9, 18, 19, 76, 77, 103) of which the last two are aqua­tints printed in colours; plus frontispiece and twenty-two numbered plates, of which the frontispiece and eighteen plates are aquatints printed in colours with additional hand-colouring (plate 22 is double-page). 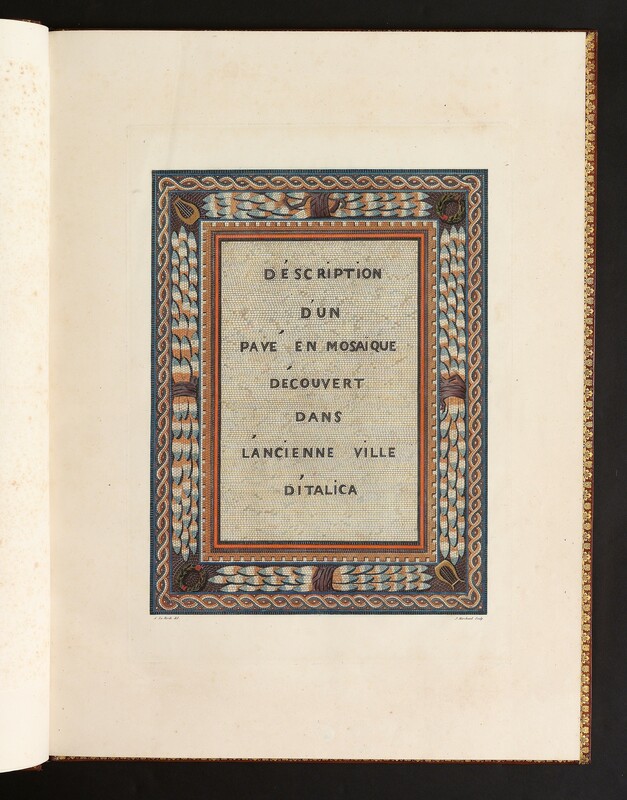 contents (folio 1) printed half-title, lettered Mosaïque d’Italica; (2) coloured engraved half-title, imitating a mosaic inscription, lettered Description d’un Pavé en Mosaïque découvert dans l’ancienne Ville d’Italica; (3) title-page (transcribed above) with engraved vignette ‘Médailles Italica’; (4) Préface, with engraved vignette (paginated 1–2); (5–7) Explication des Vignettes, with engraved tail-piece (pp.3–8); (8–12) Notice Historique sur la ville d’Italica, with an engraved head-piece and an engraved tail-piece (pp.13–18); (13–41) Explication de la Mosaïque, with an engraved head-piece and an engraved tail-piece (pp.19–76); (42–54) Recherches sur la Peinture en Mosaïque chez les Anciens, et les Monuments en ce genre qui n’ont point encore été publiés, with coloured aquatint head-piece and tail-piece (pp.77–103). illustration twenty-two numbered plates interpolated in the text, of which eighteen are printed in colours, and also finished by hand in colour (nos. , 2, 3, 4, 5, 6, 7, 8, 9, 11 [wrongly numbered 17], 12, 13, 14, 16, 17, 19, 20, 21), and four are plain (10, 15, 18, 22). 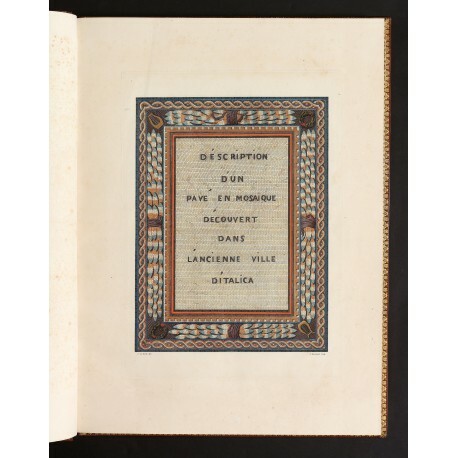 The illustrations printed with the text show medals, inscriptions, imperial portraits, a map, sculptures of the Muses (from the Towneley collection), etc. Occasional spotting, confined to margins except on the last plate; some quires of text browned. 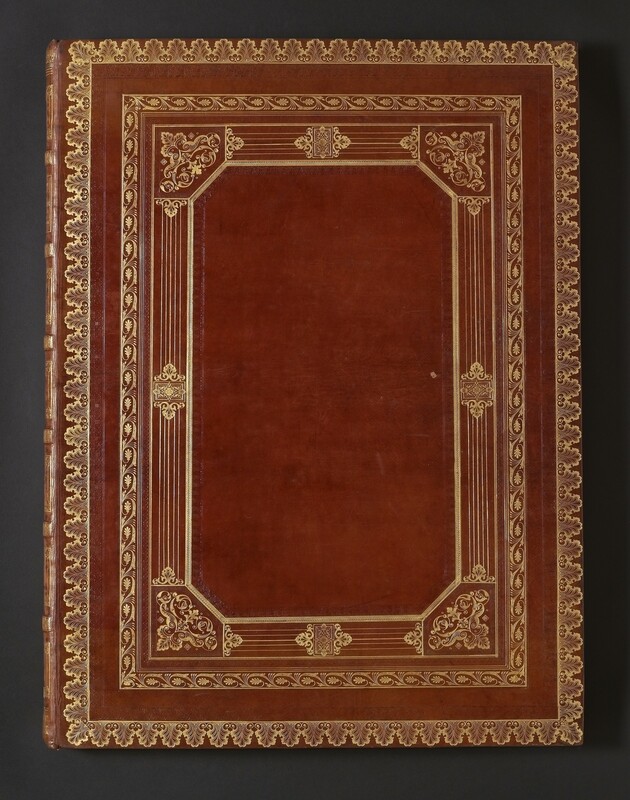 bound in contemporary russia leather, covers decorated in gilt with frames of neoclassical ornament; engraved ticket printed on green paper Gebunden bei Ph. Selenka in Wiesbaden. 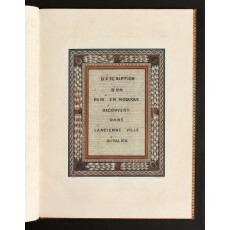 First edition of this beautifully-illustrated work documenting the mosaic mentioned in the title, discovered by labourers on 12 December 1799 at Italica in southwest Spain, reported to José Moscoso, a monk of the nearby monastery of San Isidro del Campo, and by him to Francisco Espinosa, a lawyer in Seville, who paid for it be cleaned and enclosed by a wall. Despite these measures, the mosaic was soon com­pletely lost,1 and Laborde’s work is now the primary witness. The floor measured about 13 × 9 metres. A large rectangular panel in the centre depicted a chariot-race taking place around the barrier, and the carceres at one end; the border incorporated busts of the Muses with their attributes, ani­mal, bird, and plant motifs.2 According to present knowledge, the mosaic dates from well into the fourth century. It is more interesting iconographically than other circus pavements found in Spain, as it is based on a different, more imaginative, and possibly Roman source.3 Several other mosaics are reproduced by Laborde for comparison (including a frag­ment discovered at Tarragona). The plates were drawn by the author (except for one by Jean-Baptiste De Bret, and one by Dutailly) and engraved by Jacques Marchand (except one by Louis-Pierre Baltard, one by Jacques-Joseph Coiny, and one by the author). The engravings printed with the text are after drawings by the author engraved by Coiny, Jean-Baptiste Antoine Cloquet, Louis Charles Ruotte, François Aubertin, or Leclerc. 1. According to Richard Ford, A Hand-Book for Travellers in Spain (London 1845), p.284, the enclo­sure was converted into a goat pen by French soldiers during the Peninsular War. 2. 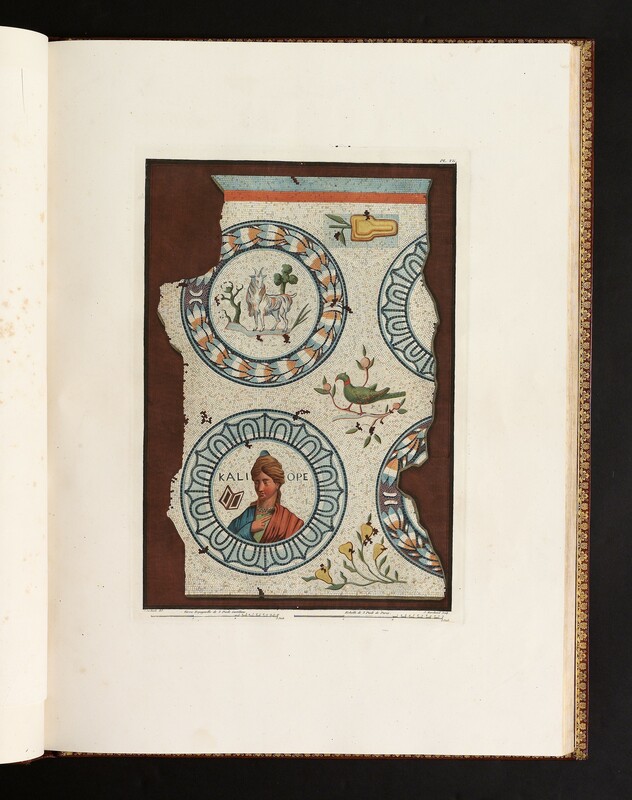 Corpus de Mosaicos Romanos de España, 2: Mosaicos Romanos de Italica, 1, by Antonio Blanco Freijeiro (Madrid 1978), pp.55–56 no. 43 and pls. 61, 68–70, 75; Joan Gómez Pallarès, Edición y comentario de las inscripciones sobre mosaico de Hispania: inscripciones no cristianas (Rome 1997), pp.135–137. 3. John H. Humphrey, Roman Circuses: Arenas for Chariot Racing (Berkeley 1986), pp.233–235; Francesc Josep Rueda Roigé, ‘El mosaico del circo documentado en Itálica’ in Locus amoenus 7 (2004), pp.7–25 (http://ddd.uab.cat/pub/locus/11359722n7p7.pdf; link). 4. Journal général de la littérature de France 5 (July 1802), p.215; C.P. Landon, Nouvelles des arts, peinture, sculpture, architecture et gravure (Paris 1802), pp.113–123, 400. 5. Cf. Palau, op. cit., vii, p.310 nos. 128974–1289745 (recording these as two editions); for the Madrid imprint, see British Architectural Library, Early printed books, 1478–1840: a catalogue of the British Architectural Library Early Imprints Collection (London 1995), ii, pp.901–902 no. 1708; and for the Paris imprint the digitised copy (Deutsches Archäologisches Institut) on the Arachne database (http://arachne.uni-koeln.de/books/Laborde1806a; link). 6. Two bindings by Philipp Selenka in the Fürstlich Waldecksche Hofbibliothek, Arolsen, are descri­bed by Rudolf-Alexander Schütte and Konrad Wiedemann, Einbandkunst vom frühmittelalter bis Jugend­stil aus den Bibliotheken in Kassel und Arolsen, Universitätsbibliothek Kassel (Kassel 2002), p.54 no. 68 and Abb. 51. He was a specialist ‘Portefeuillear­beiter’; see Hektor Rössler, Ausführlicher Bericht über die von dem Gewerbverein für das Großher­zogthum Hessen im Jahre 1842 veranstaltete Allge­meine deutsche Industrie-Ausstellung zu Mainz (Darmstadt 1843), p.240.